Six years is a long wait for the "best player in the world" to be recognized as his league's MVP. 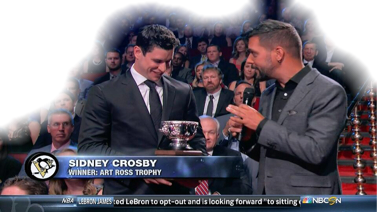 But, as expected, Penguins captain, Sidney Crosby landed his third award of the night, the coveted Hart Memorial Trophy as just that. The honor is awarded to the "player judged most valuable to his team" in the National Hockey League and is voted upon by the Professional Hockey Writers Association. Crosby won the award after leading the Penguins to the Metropolitan Division's best regular season record, tallying 104 points in the process. 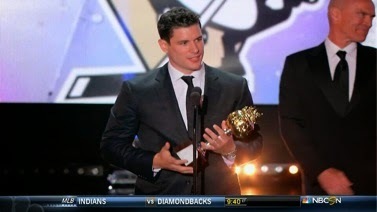 Sid led the way by capturing 128 of the 137 available first place votes. This season marks Crosby's fourth nomination for the award and his second victory, also winning at the conclusion of the 2006-07 season.